The Future is Looking Up! The future is as bright as you want it to be. Is your life looking up and is your career headed in the right direction? There was a time in my life when things did not look so good. I had a good job, I was married and had two wonderful daughters, but my life was headed in the wrong direction. I turned it around and it took a lot of work. But most of all it took planning and initiative. This blog is the first of three that will lead you in the right direction towards individual success as a leader of yourself and others. You have decided to take steps to improve your leadership skills to get that new job, or to start your own company, or venture into a new career in a different industry. You are ready to work on your new idea and take action. But the question is, do you have a plan for these actions? an idea passionately executed can lead to success! Making a plan and writing it down gives you a map to follow when you wander away from the path of your targeted goal. It helps to explain it to others who can help you reach your goals. When you are planning to sail uncharted waters that you have not traveled before, you need a map or plan that you understand to guide your way. We humans have tremendous capacity to shape and change our own destiny, but it takes thinking, planning and execution. I agree with Albert Einstein who said this about creating a plan, “If you can’t explain it simply, you don’t understand it well enough.” Keep it simple! 1. Plan to be different! Plan to separate yourself from other potential leaders. Go out and buy a new coloring book and many different colored markers. Color the picture as it has never been colored before; pink skies, blue grass, yellow trees. This simple exercise will help you to escape from the boundaries put on you by your parents, teachers, and supervisors without disturbing anyone. When was the last time you planned to do something wacky or crazy… just for the fun of it? Plan to read a book about something you have never read before. Plan to take time to talk to a new employee that you have never spoken to before. Plan to have lunch with the "smartest" person in your organization. Write these things down in your journal, plan a day and time to do them, set a reminder for yourself in your cell phone and don't just plan it… Just Do It!!! Electronically or on paper, make a plan and write it down. Review it every day and use it to prioritize your daily, weekly and monthly tasks. We all forget things from time-to-time. We do not ever know which opportunity or contact will be the best one, so write down all of them. Have a source you can refer to and to use as a guide to stay on track when you are over-tasked! It does not have to be a rigid schedule, and it can be changed as needs arise. But It needs to be like a personal secretary for you. We are often told to make a list of things we need to do this week or this month to check them off as we complete them. But when the time period is ending, and we have not finished everything, we are pressured to meet our own self-imposed deadline. This is because we put things on our list that we should have given to others to do. If you want to get more things done, pass some of them on to your subordinates. Give them a chance to grow professionally by completing some of the tasks you usually do yourself. In order not to fall back into the habit of doing these things, that someone else can do, make yourself a Don't-Do-List. This is highly recommended by Tom Peters in his brilliant book Essentials Series: Leadership, The Brand You 50. Post it up where you usually sit to make your To-Do-List. They waste your precious time, and you put them on the bottom of your list because you didn't want to do them anyway! Right? Make a plan to take responsibility for your own results. Start holding yourself accountable and stop blaming the people and conditions around you for your lack of success. Make a schedule of activities you know you need to do to improve and follow through to make sure you do them. Set lofty goals for yourself, plan to operate with speed and intensity, and don't focus on effort… focus on results. Find something that you are good at and plan to do it better than anyone else. Know which technologies you need to master and which ones to pass on to other people to do. The best life can get is when people pay you to do something that you love to do. Plan to do more of it. Your success starts with YOU. You have to decide what you want to do and make a plan to achieve it. Every day every week, hold yourself accountable! It will inevitably lead you to improvement! For more Actions and Quotes about becoming a successful leader read the first book in my Leadership Series, Looking Up! Your organization has given your department the job of solving a complicated, long-standing problem, and as the manager of this department you need to lead this effort. You have decided to put together a team of your workers to try and come up with a workable solution. So, as you make a list of requirements needed for the team, the very first item, people, has you stumped. Who do you have that can be on this team? Who will want to be on this team? Who will be the “best” people to be on the team? Who can you afford to give up to be on the team? When will they meet and where? How are you going to explain the problem in detail to them? How long should you give them to give you a solution? How will you measure their solution to see if it will work or not? So many things to think about and so little time to get started. Where is a manager supposed to start? Here are 5 critical steps that I suggest you follow. You will want to pick some of your “best” people if you want good results. But also, you should consider those employees that are always questioning your directives, and keep asking “why, why, why...” You will want four different groups represented on your team: men, women, someone who has been there for 10 years or more, and someone who has been there less than 1 year. Also, if you have a culturally mixed group of employees, try to get different cultures into the four groups mentioned before. As their leader you need to think about how you can make this a fun and productive experience for everyone. Provide a clear vision to the team as to what the solution should solve. DO NOT impart your ideas of what the solution should be, onto the team. Explain the importance of this effort and how it will help the individuals and the company grow and be better. Set a high goal or expectation for an exceptionally good result that can be implemented. DON’T ask for a little, ASK for a lot! As their leader, you need to remove barriers that keep the team within boundaries for the solutions. Old paradigms of how things should be solved need to be thrown away. Seek ideas and solutions that were not in their minds before they gathered, and solutions that do not include compromises or cause other problems. Make sure they have adequate time, materials, and place to work undisturbed. Allow them to select their own internal team leader and recorder. Ask them what other resources are needed that will help foster creativity and fun for them team. NOTE: Surprise them, by having a trainer, or co-worker not on the team, play a game or exercise that makes them laugh; is fun, and causes them to use their brains to solve a puzzle… (warm them up) before they start working on the real problem. The team may need to have some facts about the current situation to know how bad it is or how far they want to take the solution. Be sure these are the facts and not just someone’s opinion, or old historic data. They will need fresh factual data. Make a computer available to them that they can use to retrieve data from across the organization that may provide direction or details to answer their many questions. Inform other managers about the importance of answering their questions as soon as possible with factual data and giving them the support needed. When the results are in and the team has a solution, make sure you celebrate. No matter how large or small the victory is, be sure to celebrate. Acknowledge the team’s efforts, give them appropriate rewards if that is your company’s culture and give all team members recognition. Failure to celebrate or recognize their hard work will make it harder next time to get people to volunteer to be on your next team. 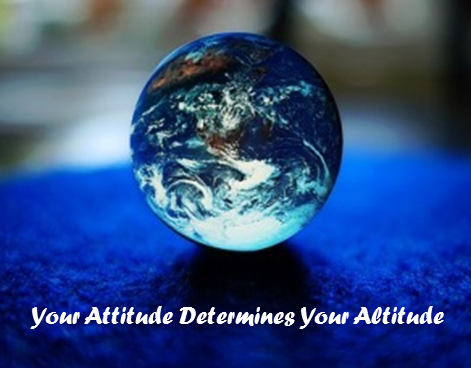 Remember that Your Attitude Determines Your Altitude and almost any problem can be solved with a positive attitude and the mixing of minds that are motivated and have a clear goal. Young leaders, or those who are preparing to move up into a leadership position, usually face a common problem. The future looks exciting to you! You are excited and ready to become the leader your company needs. For others, you are already in a new leadership position and facing the same problem. Companies all over the world make the same mistake. When a leadership position becomes vacant and they need to fill it, they look around and find their best technician or best administrator and push them up into the position. They promote their best technician into a Manager’s leadership position, and when he or she becomes the best manager, they move them up into a Senior Manager's leadership position. Then, when they become the best Senior Manager, they move them up to a Director’s leadership position… and then they fail. Companies frequently promote competent people until they become incompetent. Yes... they promote you until you fail. The company assumes: because you were successful at the last level, you will be successful at the next higher level. When did this company take the time to “groom” or train you for the next leadership level? Without giving you the tools needed for the increased level of responsibility and new leadership skills, they thrust you into the position… and hope for the best. How will you build the trust of the Senior Leaders and Directors already in lateral positions to your new position? How will you motivate your new subordinates where others have failed… Or replace a leader that was loved by the workers? What new tasks will you keep and which ones will you pass on to others? After all, you can’t do everything by yourself. What you need is a Personal Professional Strategic Plan. You cannot afford to move into a new leadership position without a good plan! • What are your opportunities and what are the threats to your advancement? • Who can help you reach your leadership goals? • What problems do you need to avoid? Don’t wait for the future to come to you—learn how you can start to create it today! Asking for help is s sign of strength, not a sign of weakness! For more information about "Jump-Starting" your successful leadership career, contact me at mike@michaelwader.com. Подпишитесь на электронную рассылку и обновления.